If you have read this blog for more than a day, you know that one of our favorite things is the incredible, edible egg. We have our own talented chickens. We have a large collection of egg cookbooks. One might just think that everything there was to say about the egg had been said. We beg to differ. 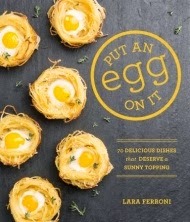 Put An Egg On It by Lara Ferroni is one of those "ah ha" inspiring moments. Rather it is one of those, "Why didn't I thing of that?" moments. There is almost no food item out there that is not greatly enhanced by an egg sitting on top. "Ice Cream!" you might say. Well what is meringue if not whipped and airy eggs. So that settles it. An egg is a great addition to any food. An egg is the salvation of leftovers. Cold pizza comes alive when warmed with an egg sitting on top. Leftover rice? Sit and egg in the middle for a great lunch. Oh my, we could go on and on, but thanks to Put An Egg On It, we don't have to. Now here is where we were a bit skeptical. There was a certain worry that this was a book of trite recipes with an egg sitting on the top. Not to worry, Ferroni has assembled a series of thoughtful recipes that are complimented by the addition of the egg, making it the star and not merely an afterthought. The book starts out with egg basics and right off the bat provided recipes for both a regular and sweet pickled egg. Then some basic meringue recipes and techniques. Both will come in handy later on. There is a Blasted Cauliflower with Eggs and Brussels Sprout Hash. There are hip, happening grains like farro, buckwheat, and grits. There is even Israeli couscous, which looks rather grain-like but is actually a pasta. There is a lot of pasta. Carnivores have their say with a traditional steak tartare along with pork, chicken, and fish dishes. Even tacos and hot dogs make an appearance. That meringue we learned to make at the outset, proves valuable for the dessert section. Lest we forget, there is also a cocktail chapter, because what's a flip without an egg? This is a great example of making the egg and integral element of what might be a familiar dish. This light and airy version will have you heading for the kitchen. Spring Onion Soup with Soft-Boiled Eggs. Clean the onions well and chop just the lights and light green parts. Melt the butter in a medium soup pot over medium heat. Add the onions, time, and salt. Reduce the heat to medium low and cook, stirring occasionally until the onions have softened and turned deep golden, about 30 minutes. Increase heat to medium-high and stir in the wine; cook until reduced by about half, about five minutes. Add the stock, along with one cup water and the bay leaf, and bring to a boil. Reduce the heat and simmer for 20 minutes. Season to taste with salt and pepper. Remove and discard the bay leaf. Preheat the oven to 350°. Brush the baguette slice with a little oil and toast for 5 to 10 minutes, until golden. While the bread toasts, soft boiled the eggs. Ladled the soup into 4 individual ovenproof bowls (I like to use mini coquettes), filling them only three-quarters full. Top each with a toasted baguette slice and one quarter of the cheese. Place the bowls on a baking sheet and broil for 1 to 2 minutes, until the cheese is bubbly and golden in spots. To serve peel the eggs (or scoop them from the shells) and place half of an egg on top of each bowl of soup. What a refreshing change from the usual bowl of brown onions and a thick crust of cheese. Ferroni not only writes cookbooks, she is an accomplished photographer who has contributed the photos to several of our favorite books including Top Pops and Absinthe Cocktails. Even if you don't have your own chickens, run out to the framer's market and grab a dozen -- grab two. Then crack open Put An Egg On It. You won't be sorry. Adding an egg is my solution to adding protein to a carb heavy meal. Leftover lentils? Add an egg. Nice cookbook!